Our loyal & friendly staff have developed an excellent rapport with the many independent decorators and large contractors, offering a service that is second to none. We offer Trade Discounts to trade customers and contractors, large & small with full account facilities (subject to the usual checks). We support the In-Direct Supply system by both Crown & Dulux Paints. 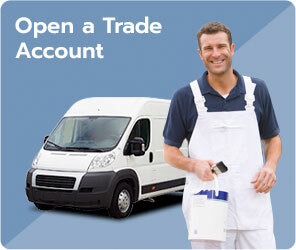 If you have an indirect account with Crown or Dulux and would like to deal through us, please contact us. We understand the importance of having products readily available to our contractors and trade customers. Our vast warehouse, houses the variety of products ranging from Dulux, Crown, Macphersons to Sikkens, Ronseal & Hammerite, ensuring that whether you require 1 to 20 tins, we should have them in stock, ready to take away. In store we are able to mix thousands of colours from leading & emerging brands. We offer an Extensive range of paints, expert advice & services, all at competitive prices. We are also able to offer an excellent colour matching service, just bring your colour sample in store and our colour matching advisor will match the colour you require.